I plan to ride my bicycle from my home in La Jolla, Ca. ending my journey at an Organic farm just East of San Francisco, Ca. I expect to visit 8 farms and anticipate that the trip will take me 45 days and cover approximately 700 miles by bike and 100 miles by foot. 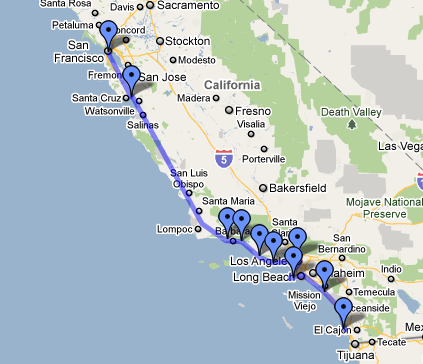 Sounds like a great trip but I don’t see the Sonora leg – That’s a town northeast of Modesto in the Sierras. Are you really riding up there too?? Quite a ride and will be checking in. Thanks Sue! Yes, I plan on going to a Turkey Farm in Sonora. If time permits…….